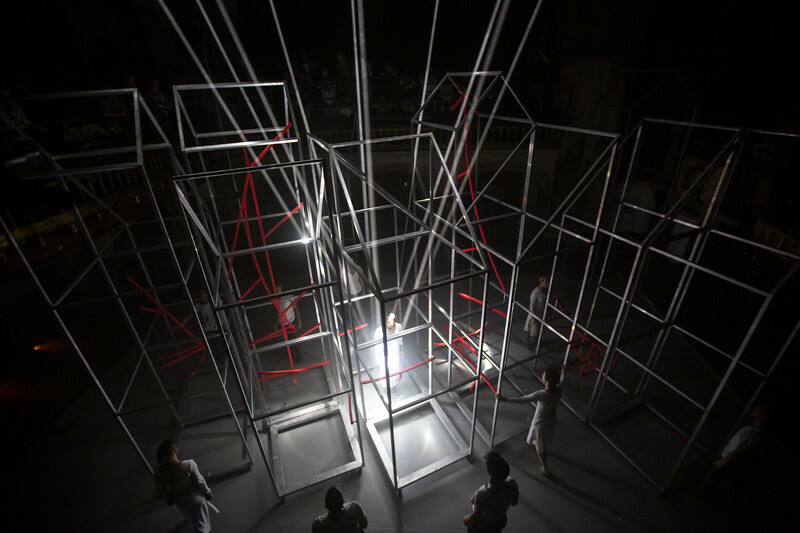 The short-run performance schedule for Nest, an original work by London-based ballet and contemporary dance company New Movement Collective (15-24 July 2013), took place in what was once The Limelight nightclub on Shaftsbury Avenue. In the temporarily disused building, the collective transformed the multi-level former chapel, designed by James Cubitt in 1888, into a kind of ship’s hull with multiple bays, each uniquely staged. 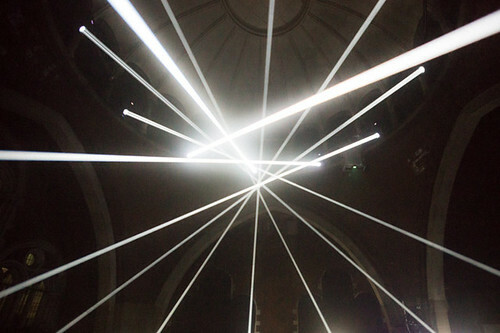 Marshmallow Laser Feast’s light installation across the floor of the former Welsh Presbyterian chapel. Top: the cast of Nest surrounding the tower-like structures, designed by architecture practice Studio Weave, as they begin to take shape as the Odysseus’s ship. 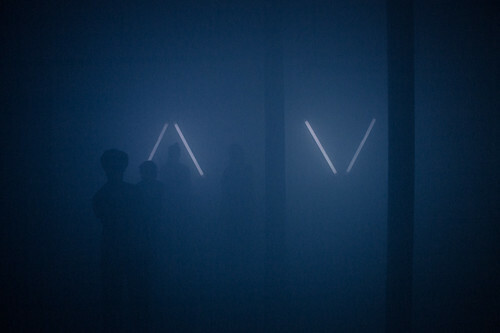 Loosely based on Homer’s The Odyssey, Marshmallow Laser Feast’s light installation lit the primary performance space within the chapel’s hazy internal dome. Grid-like projections crossed with mobile structures (designed by the architectural practice Studio Weave) as agile bodies crept over, in and through the many lit towers and surfaces. This first act was seen by the audience from the left and right balconies above. Taken during the second act by photographer Barnaby Steel, the image shows dancers and audience members. The second act, down flights of rope-lined staircases in the concrete basement, was more disorienting, lit only with triangular neon tubing and an eerie glow that seeped from an open door. 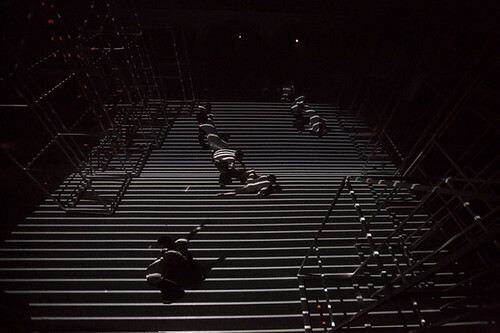 The style of dance, in keeping with the more rapid and percussive score, by Canadian composer Christopher Mayo and electronic music composer / performer Anna Meredith, confronted the audience and was staged without boundaries dividing the dancers (some of whom were in street clothes) and viewers. Subsequent acts included a spinning mirror-centric piece that toyed with reality, altering the circular form with careful lighting to flip between a reflective and semi-transparent surface, and an act that brought the spinning architectural structures together to form an artistic interpretation of a ship’s ribcage and sail. The final scene, once again in the venue’s hull, falls in line with The Odyssey’s conclusion and sees Penelope and Odysseus reunited in dance. Beams of light from the chapel’s dome. Principal dancer / producer Malgorzata Dzierzon said that the choreography ‘responds to the building, to its history’, a statement which rang true throughout. The dancing was exemplary yet the impact of the choreography came from the space, the voyeuristic feeling given to the audience on their individual adventures through the building in the penultimate act – to experience a bay of pigs; a room filled with beanbags for viewing animator Filipe Alçada’s dripping flowers projected on the ceiling; and a piece where a dancer was trapped like a fly within lengths of elastic. In the final scene of the performance, the focus is on the movement and relative quiet of Penelope and Odysseus’s reunion. Photograph by Barnaby Steel. ‘Stone Nest’, an exhibition of images, film, props and stage design of Nest as well as workshops and performances, will be installed at Testbed1, 10-20 September 2013. Sarah Snaith, design writer and editor, London.